We were inspired by the educational platform Kahoot because of its ease of use and widespread popularity in classes. We decided on the name Patriotic Pirates because our team consists of members from rival schools. Our school mascots were respectively the Pirates and Patriots. Hence, the name Patriotic Pirates. This web app is a math competition game. Rather than presenting questions of multiple choice format, teachers have the ability to create open ended questions that challenge their students' critical thinking, Through this, the teacher can better assess a student's ability in math while a the same time provide a fun competitive but educational environment for students. Students are able to write Latex symbols directly, allowing them to utilize advanced math symbols and formulas in their work space. 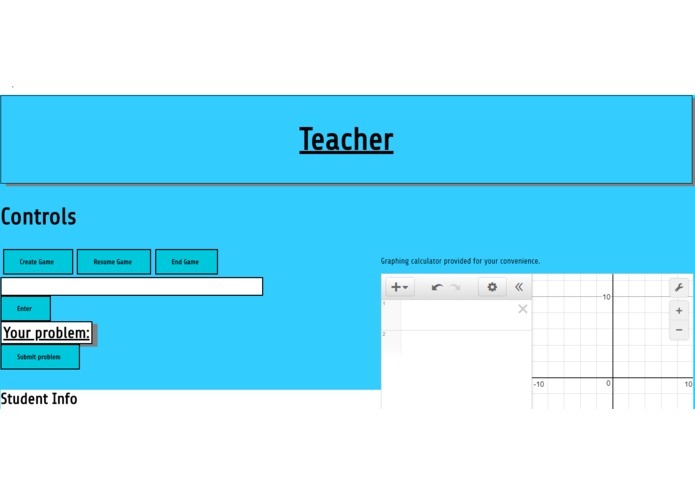 We used the desmos and mathjax api to set up the math environment and used express and socket.io to handle the backend. Screen shotting, learning how to use math.jax and the transfer of data through socket.io. 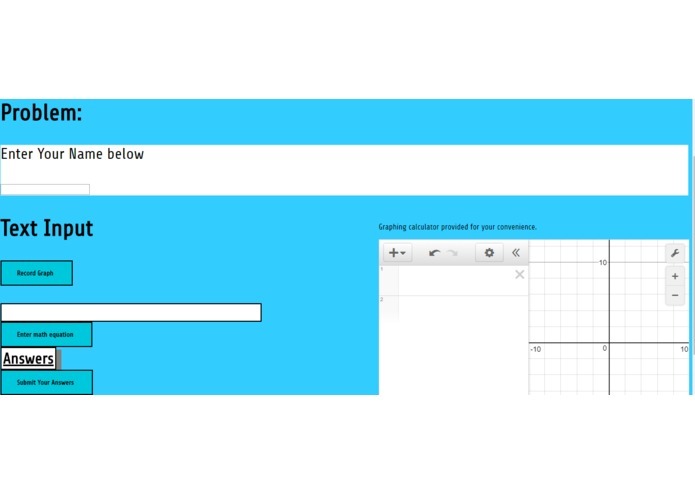 Displaying graph from desmos and saving image in the table. Routing images, Latex symbols, graphs with socket.io from students to the teacher. We learned how to leverage third party applications and use socket.io to route data. Use Firebase to create an authentication system that allows students to sign in and save user's responses in a database. I worked on the HTML and CSS of the web app, making it look nice. I implemented third party applications in the web app such as Latex image support with mathjax and graphs with desmos. I worked primarily on the html & css portion of this project, while giving ideas about what to put in.